What could be more thrilling than following in the footsteps of some of the world’s famous climbers? Allow us to take you to Everest Base Camp on an iconic journey through the beautiful Khumbu region and Sagamartha National Park. The Everest Base Camp Trek is certainly a challenge, 12 days of walking, high altitudes, rocky tracks, and some pretty steep inclines, but what an achievement to say you reached the base camp of the highest mountain in the world, especially as the Everest Base Camp is actually higher than a lot of the peaks of other mountains! 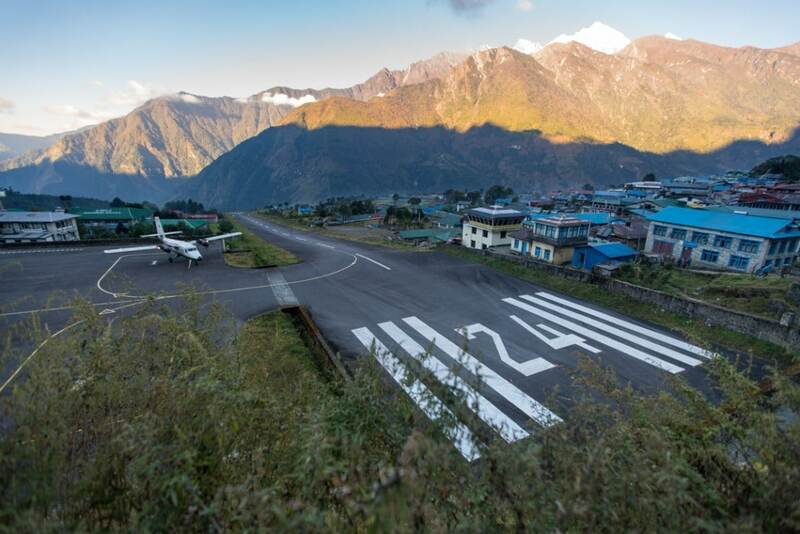 After a breathtaking flight to the mountain town of Lukla, your Everest Base Camp tour begins. There are a million photo opportunities as you trek amidst the magical Himalayas, with spectacular views of Kwangde, Nuptse, Lhotse, Kangtega, Ama Dablam and Everest to name just a few. The bustling Sherpa town of Namche Bazaar and the gateway to the high Himalaya is an impressive sight not to be missed, where the colorful homes and teahouses are strategically perched on the hillside. The approach to Tyangboche is something that will imprint on your mind for years to come as you gaze out to the ornate monastery amidst the most amazing panoramic mountain backdrop you will have ever set your eyes on. As the altitude increases, the landscape becomes more remote and you cannot help but wonder how the locals survive in such an environment, but that they do, following age-old traditions and living an uncomplicated life, undisturbed by the hustle and bustle that comes with a modern-day society,it is truly a life like no other. Upon touring Everest Base Camp, an inevitable sense of achievement will prevail as you sit amongst some snow-capped giants and rejoice in conquering this famous route. And if that was not enough, we take you to the height of 5545 meters, to the summit of Kala Patthar to witness Mount Everest in all her glory, towering above the other glistening peaks of the Himalayas, giving you memories that will last a lifetime. Also, take a look at 14-days Everest Base Camp Trek without city tour in Kathmandu. Please click here for Everest Base Camp Trek information in the Chinese language. Activities: We will meet you at the airport and drive you to your hotel, just relax for the rest of the day to recover from your long journey. Highlights: Bustling Thamel, an array of restaurants, bars and shops. Accomodation: Kathmandu 3 star hotel. Day 2: Meeting with trekking guide, last minute shopping for your trek and Kathmandu sightseeing. Highlights: Pashupatinath, Boudhanath Stupa, Swaymbhunath and Patan Durbar Square, cultural and historical sights of the Kathmandu Valley. Day 3: Flight to Lukla (45 minutes) and trek to Phakding. Elevation reached: 2840m/9318ft in Lukla and 2610m/8563ft in Phakding. Terrain: Flat and downhill, well-developed paths, stone steps. Views on offer: Amazing Himalayan views on the approach to Lukla. Highlights: The breathtaking flight between the mountains, the first day of your Everest Base Camp Tour. Hours of walking: 6 Approximately. Terrain: Rocky and dirt tracks, stone steps, mostly uphill, gradual with some steep inclines. Views on offer: Spectacular approaching views of Namche Bazaar, snow-capped peaks, and the river valley. Highlights: The colorful Sherpa town of Namche Bazaar – the gateway for a tour to Everest Base Camp and crossing some impressive suspension bridges over the river valley. What’s to see : The milky waters of the Dudh Kosi River, thick rhododendron, magnolia and fir tree forests, herds of yaks carrying supplies. Elevation reached: 3962m/12998ft at Mountain View Hotel, 3790m/12434ft at Khumkung. Terrain: Hilly, grassy trails, some steep inclines and flat tracks. Views on offer: Everest, Lhotse, Lhotse Shar, Taboche Peak and Ama Dablam. Highlights: Your first sight of Everest! What’s to see: Khumjung Edmund Hillary School, Sherpa museum, shops and markets around Namche Bazaar. Terrain: River bank path, some steep inclines, some flat and some short descents. Views on offer: Kwangde, Nuptse, Lhotse, Kangtega, Ama Dablam and Everest. Highlights: Tyangboche monastery, magnificent panoramic views from Tyangboche. What’s to see: The Lamas and Monks in the stunning Tyangboche Monastery, ornate wall hangings and a 20 foot statue of Lord Buddha. Terrain: Rocky uphill tracks, stone steps, a gentle riverbank trail. Views on offer: Lhotse, Island Peak, Ama Dablam. Highlights: The beautiful location of Dingboche under Ama Dablam, the mountain views from your teahouse. What’s to see: A Yeti scalp in the Pangboche Gompa, the fast flowing waters of the Imja Khola, sacred mani stone walls. Terrain: Rocky and steep inclines. Views on offer: Remarkable view of Makalu and Lhotse. Terrain: Some steep inclines and rocky tracks where you will need to scramble for a short time. Views on offer: The Khumbu Icefall and Pumori amongst other beautiful Himalayan mountains. Highlights: Reaching the top of a steep incline for breathtaking panoramic views amongst Buddhist chortens. What’s to see: Memorial sight for people who sadly lost their lives attempting to summit Everest, traditional Sherpa houses. Da 10: Everest Base Camp and Gorak Shep. Elevation reached: 5300m/17388ft at Base Camp and 5170m/16962ft at Gorak Shep. Terrain: Uneven, ridge tracks, rocky, uphill and flat trails. Views on offer: Too many to mention! You will be surrounded by an icy wonderland, get your cameras at the ready! Highlights: Congratulations, you made it! You reached the base camp to the highest mountain in the world. What’s to see: You may see a group of mountaineers preparing to attempt an Everest summit. Sunset views from your Gorak Shep teahouse. Day 11: Kala Patthar and Pheriche. Elevation reached: 5545m/18192ft at Kala Patthar, 4270m/14009ft at Pheriche. Terrain: Steep, rocky climb to Kala Patthar and a gentle descent over rocky and some well defined paths to Pheriche. Views on offer: Everest and the surrounding Himalayas. 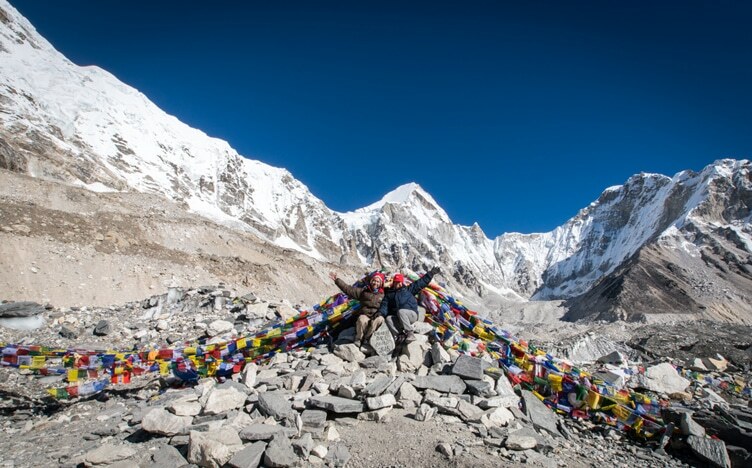 Highlights: The most spectacular, panoramic views from the top of Kala Patthar. What’s to see: Sunrise from 5545m amidst a mountain wonderland, simply amazing. Views on offer: The River Valley and snow-capped peaks in the distance. Highlights: Returning to this vibrant Sherpa town. What’s to see: Check out the local markets, bars and restaurants. Terrain: By the banks of the river, stone steps and some descents and last ascents up to Lukla. Views on offer: The glistening river amidst a mountain backdrop. Highlights: Last day of walking in the Khumbu region. Well done, you completed your trip! What’s to see: Thick forests, an array of birds and some final views of the mountains. Day 14: Flight back to Kathmandu. Highlights: Another breathtaking airplane ride on a twin-engine otter amidst the mighty Himalayas. Accommodation: 3 star hotel in Kathmandu. Highlights: Time to shop, relax, get a massage. Time to go home and tell your friends and family of the fun and adventure you had on your tour to Everest Base Camp. Or, you can extend your trip. We can arrange many other tours and trips for you, such as Chitwan Jungle Safari, River Rafting Adventure, Scenic Flight, Cycling or even another trek in a different region. Mosaic Adventure will be both pleased and honored to be at your service. We can operate private Everest Base Camp Trek throughout the year, please contact us if you want to book private tour at custom date as per your preference. Jun 1, 2019 - Jun 16, 2019 ? Jun 15, 2019 - Jun 30, 2019 ? Jun 29, 2019 - Jul 14, 2019 ? Jul 13, 2019 - Jul 28, 2019 ? Jul 27, 2019 - Aug 11, 2019 ? Aug 1, 2019 - Aug 16, 2019 ? Aug 10, 2019 - Aug 25, 2019 ? Aug 24, 2019 - Sep 08, 2019 ? Dec 21, 2019 - Jan 05, 2020 ? Jan 2, 2020 - Jan 17, 2020 ? Jan 17, 2020 - Feb 01, 2020 ? Feb 1, 2020 - Feb 16, 2020 ? Feb 16, 2020 - Mar 02, 2020 ? Jun 2, 2020 - Jun 17, 2020 ? Jun 6, 2020 - Jun 21, 2020 ? Jun 20, 2020 - Jul 05, 2020 ? Jul 4, 2020 - Jul 19, 2020 ? Jul 18, 2020 - Aug 02, 2020 ? Aug 1, 2020 - Aug 16, 2018 ? Aug 15, 2020 - Aug 30, 2020 ? Aug 29, 2020 - Sep 13, 2020 ? Sep 5, 2020 - Sep 20, 2020 ? Sep 8, 2020 - Sep 23, 2018 ? Dec 19, 2020 - Jan 03, 2021 ? Guaranteed - Trip is Guaranteed to run. The Everest Base Camp trek is considered to be a relatively strenuous trekking route in Nepal, but, that does not mean that you require any previous trekking or mountaineering experience. You are attempting to reach the base camp, not climbing to the summit itself, it is not required that you have any technical experience, only that you be in good physical condition and are able to walk for four to six hours per day over hilly terrain with a light bag pack. If you are not an experienced trekker or do not exercise regularly, we recommend that you embark on a training program well in advance of commencing this trip. You will be given plenty of time to rest throughout the trek and the pace will be slow to help you acclimatize safely to the increasing elevation. Please read this preparation guidelines for an Everest Base Camp Tour. What is the level of accommodation like? In Kathmandu, your accommodation will usually include an attached bathroom and have facilities such as air conditioning, reception and dining services. The level of accommodation is generally Nepalese 3 star and is comfortable and clean. If you require an upgrade of accommodation in Kathmandu, there are many 4-star and 5-star options at an extra cost. Please do not hesitate to contact us if you require an upgrade. Once you start your trek, you will be staying in “Teahouses.” Accommodation is limited, especially the higher you get, so your room may vary from a private single/double room to a bed in a dormitory. Bed mattresses are usually firm, not sprung mattresses that you may be used to at home. The accommodation is very basic and there will usually be shared shower and toilet facilities. There is a communal dining hall in all teahouses offering limited meal choices. Although basic, the teahouses are clean and are a welcome, friendly and warm resting place after a day trekking. Is enough drinking water available? How many liters of water shall we carry in our day pack? We ask that all our customers bring water purification tablets and a water bottle with them. (they can be bought in Kathmandu if forgotten) Mosaic supports responsible tourism so we do not encourage trekkers to buy bottled water when in the Himalayan region, although it is available, there is no proper disposal system for plastic bottles and we would like to keep our mountains clean and trash free. There will be plenty of water available along the way to fill your bottles and most brands of purification tablets take just 30 minutes before you can drink your water. We recommend that you drink a minimum of 3 to 4 liters of water per day whilst on your trek. Where can I keep my luggage? Any luggage that you will not require during your trek can be kept securely in the hotel in Kathmandu or in the storeroom of our office. Do I need to take walking poles? Walking poles are not essential but can be useful especially on the way down. Poles help you balance on the way down and take the strain off of your legs (quad muscles) on some of the steep climbs. You can buy or hire poles in Kathmandu and they easily collapse so you can attach them to your backpack when they are not needed. Can I buy any equipment in Kathmandu before the start of the trip? There are plenty of trekking shops in Kathmandu selling equipment inexpensively compared to the prices you would normally pay at home, although, the quality of these products cannot always be guaranteed. If you do not want to take the risk, we recommend you buy major items such as trekking shoes, before you arrive in Nepal. It is also recommended you buy your shoes well in advance of your trek so you can “break them in” and avoid blisters during your trip. Read this Packing list for Everest Base Camp Trek. Can I recharge my iPod, batteries, cameras etc… while on the mountain tour? Yes, you can, in the teahouses. Please remember that plugs might be different than at home so don‟t forget to bring adapters with you or buy them in Kathmandu before the trip. You will have to pay for the use of the electricity to recharge your electrical items, usually at a cost of $2-3 US per hour. Is it recommended to get a Nepalese visa in advance or at the airport? If you want to avoid the sometimes lengthy queues at the airport, you can obtain a visa from the Nepali embassy in you home country before you travel. Please visit the appropriate websites in your country for details. 25 USD for 15 days. 40 USD for 30 days. 100 USD for 90 days. We would advise you to bring US dollars to pay for your visa, most major currencies are usually accepted also. Although there is a currency exchange in the airport (if they will not accept your currency), you may not get the best exchange rate; therefore it is always a safe bet to bring US dollars. Can we take showers during the trek? Showers are available at the teahouses. They will usually be shared bathrooms in most teahouses, especially the higher up you go. You will have to pay for a hot water shower per person. The higher you are, the colder it gets and you may find that you do not want to shower as often so you can wait just a few days until your descent. How much money per day do you think I will need? What currency should I take? The local currency in Nepal is rupees. We recommend you bring US dollars with you to Nepal and exchange them here as this is easily done and is a widely accepted currency. Although you may get a lesser rate on traveler‟s cheques, we suggest you carry a mixture of both depending on your needs. The amount of money you will need on a daily basis depends on your spending habits. A guide would be $10 per day for extra drinks and bar bill during your trek and $20 per day to cover lunch/dinner whilst in Kathmandu. What do I have to carry with me on trek? What if I get sick while on trek? It depends on the nature of the sickness. Usually, if you become sick, you will descend to a lower altitude with the help and support of the guide and porters. If you are seriously ill, we will arrange an emergency helicopter evacuation service. Our guide will take immediate action according to the situation. Please ensure you arrange travel insurance that covers you for an evacuation service and trekking at high altitudes. *Altitude sickness can affect everyone whilst trekking including young and healthy people and is a genuine concern in higher altitudes. If you have symptoms like dizziness, headaches etc then you should return to a lower altitude as soon as possible. Do not take altitude sickness lightly. It can be fatal! Please familiarize yourself with the symptoms of altitude sickness before your trek. Do not ignore even the mildest of symptoms, inform your guide immediately. Our guides carry basic medicine and first aid equipment including simple painkillers, altitude sickness tablets, bandages, balm for muscle ache and medication to treat diarrhea and vomiting. √ Hotel in Kathmandu with breakfast. √ Guided Kathmandu city tour with entrance fees by private vehicle. √ All your standard Meals (breakfast, lunch and dinner) during the trek. √ Teahouse accommodation during the trek. √ Government licensed English speaking Guide and Porters to carry your luggage during the trek (1 porter Between 2 Person basis); their food, accommodation, salary, insurance, equipments, medicine. √ Round Trip flight fare Kathmandu –Lukla – Kathmandu. √ All our government taxes and official expenses. × Lunch and dinner during your stay in Kathmandu. × Personal trekking equipment except stated above. × Any loss arising due to unforeseen circumstances that is beyond Mosaic Adventure control. The adventure I had was both amazing and challenging. I rushed my body to the limits and also had my eyes opened to the most beautiful sights. I made lifelong friends with other trekkers and shared moments of sickness, happiness and achievement, all with the trust and joy of my excellent guide Pralhad who I will never forget. If you're looking to do trekking in Nepal then stop looking at other companies because this is the one you want to go with. In the main office, Madhav does an excellent job of planning your trip and making sure everything is to your liking. Even half a world away, he answered all of my emails within 24 hours. He will do everything within his power to make sure your stay in Nepal is nothing short of amazing. On the Everest base camp tour, my guide Rishi was equally impressive. So if you have the opportunity to request a guide, request him. He always made sure we stayed at clean and comfortable teahouses with good food. It was also nice to have someone looking out for signs of altitude sickness and checking up on your health and acclimatization, daily. He also knows all the good places to take pictures and is very knowledgable of the surrounding mountains and wildlife. You should also bring some cards with you and ask Rishi to show you some of his magic tricks. The trek itself is the trip of a lifetime and I can't accurately describe it here, so you should just do it! In Kathmandu, Keshar was a fountain of knowledge. During my city tour he told me everything I wanted to know and more. I got so much more out of the places he took me to with his keen insight. Keshar is a great student of Nepalese history and culture and is very enthusiastic about it. I couldn't have asked for a better city guide. If I ever have the fortune to make it back to Nepal I will certainly be booking my trip with Mosiac Adventure. I highly recommend Mozaic.I booked with Mozaic at the last minute, and they helped me with everything. I arrived in Kathmandu a week before my trek and they still offered to pick me up and take me to my accommodation at a different hostel from which they use at no cost. They explained what I would need to buy and where to buy it and what to look at before our Everest Base Camp Tour. We had an amazing guide with us on our trek who seemed to have more patience than any one I know. There was 4 of us on the trek and one of the guys was 62 but our guide Shanker managed to get us all to our daily destinations safely. When I arrived back in Kathmandu I fell really sick and had to go to Hospital, When Moziac heard of this they immediately contacted me and were willing to make arrangements to take me to a good hospital. Further more my Bank stopped my cards working and Mozaic happily offered and lent me money to cover all my costs until I sorted my my bank out. All this based only on trust having no idea if they would see me again. Thank you so Much Rajendra, Madhav and Shanker for making my Trek and time in Nepal amazing. Cant wait to come back one day. My wife and I recently completed an 11 day Everest Base Camp Trek through Mosaic. We did not know who to use and relied upon Mosaic's high tripadvisor rating. We are so happy that we did. Everything went as planned and our tour guide could not have been better. He was 30 years experienced while other guides we met on the trail were quite young. Our group was just the 2 of us while other groups were 10 to 15 people. Madhov responded quickly to my emails, met us at the airport, and was wonderful to work with. They also provided down jackets and warm sleeping bags which is not common with other tours. Could not offer a higher recommendation. Just be warned that the Everest base camp trek is incredibly difficult and you must be in good shape. Everest Base Camp Trek, one of the most amazing things I have done and it was thanks to Raj and his team at Mosaic Travel. Was catered for every step of the way and shown things along the way that was above the requirements of the guys and made it a truly amazing individual experience! One of the best two weeks of my life! Thanks Mosaic! Nepal is a beautiful country. It's natural resources in the Himalayas as well as the southern jungles are completely unique. Any person with an adventuresome bone in their body would be thrilled and delighted seeing this country. Mosaic Adventures did an excellent job of providing a first time visitor to Nepal the guidance and framework for experiencing the beauties of the country. My trip was well planned and well managed and everything went off without a hitch. I would highly recommend their services to anyone contemplating visiting Nepal. The trip would be memorable. We went on Everest Base Camp trek in July from Mosaic Adventure Trek with Gokul who was our trekking guide. He was excellent, helpful and spoke Spanish fluently. Mosaic provided us with very good service. I would recommend Mosaic Adventure Trek Expedition and Gokul to all trekkers. A great trip with some lovely views, interesting guide and good accomodations+food. Unfortunately we didn't get the best view of Mt. Everest but after all it was the monsoon. However, we did get a fantastic view on the way down. A highly recommended organization and a friendly team of people.